Hosted status pages for system performance and downtime communication. How does this work with Heroku? Why have a public status page? 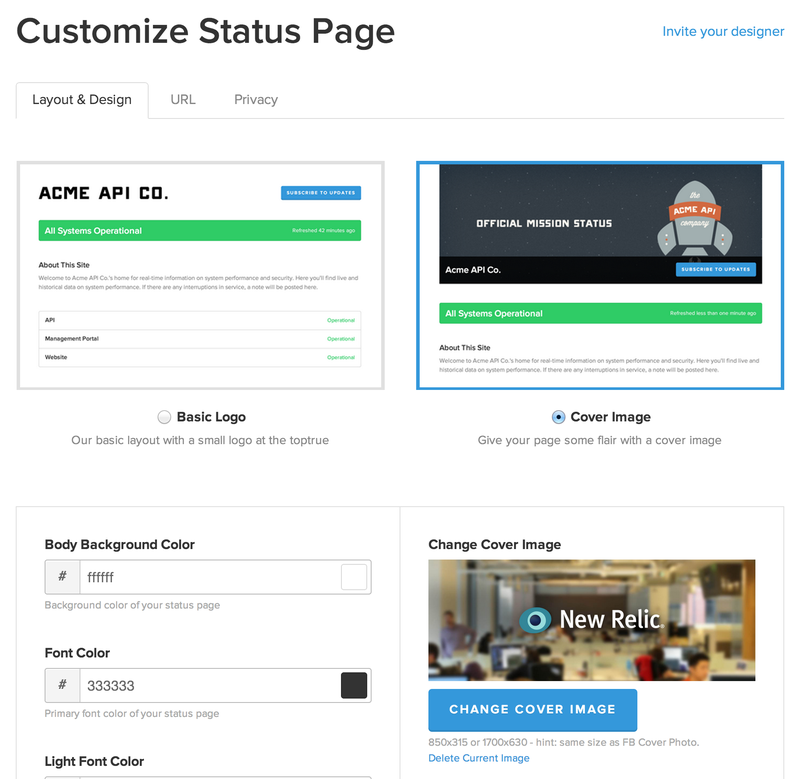 StatusPage.io is the easiest way to create a branded status page for your company or app. Each page is composed of tools for downtime communication and history, as well as key system performance metrics that allow you to show future and prospective customers how good you are at your job. Status pages also act as a great deflection of support tickets coming from users that are experiencing issues that you’re already aware of. StatusPage.io lets you control what your page looks like by allowing you to set a custom logo, custom CSS values, a CNAME domain (status.yourdomain.com), and favicon. Your page is intended to have exactly your look and feel, and we want the page to be a great representation of your brand. 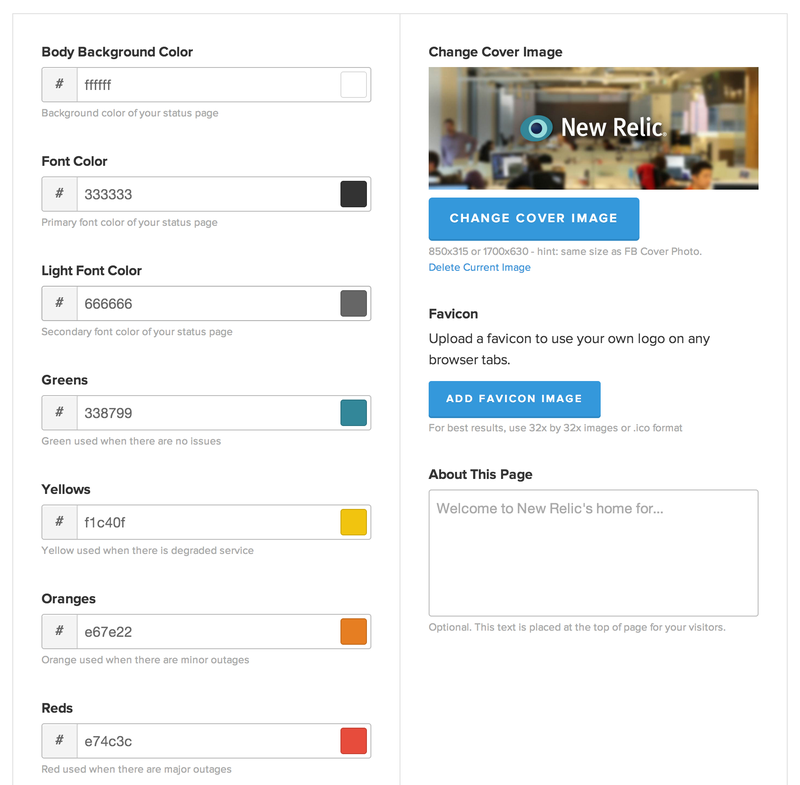 Heading over to the management portal, you can quickly and easily get your page set up. Metrics can be added via our management interface once you have your account signed up for at least a Startup plan. We currently support linking data from Pingdom, Librato, New Relic, Datadog, and TempoDB. 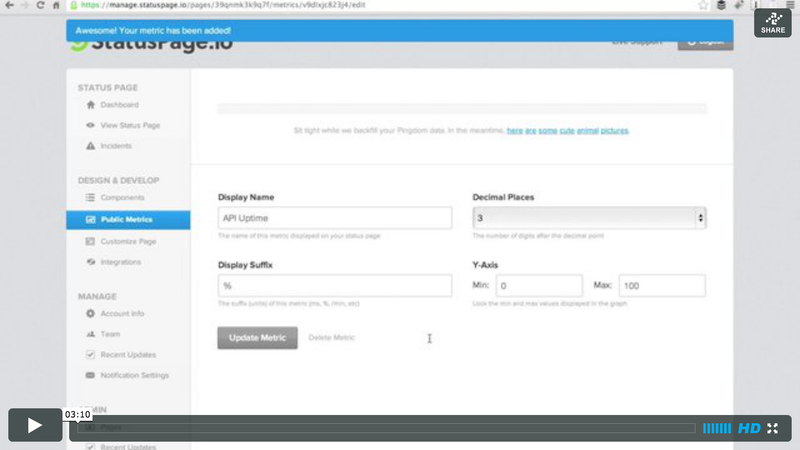 Reporting of downtime or performance incidents can be done via our management interface, or via the StatusPage.io API. We also have a Hubot Script written by the lovely Mathias Meyer from Travis CI. Heroku allows you to override the pages that are shown when your application encounters an error, or when you’re in maintenance mode. Using your custom status page, we can leverage your look and feel to create custom error and maintenance pages that get used for your Heroku app, and that contain your most recent status based on information we have about your page - open incidents, metrics, etc. Enabling these pages is easy, and can be done once you’ve added the StatusPage addon by visiting the Heroku Integration section in your Management Portal. Having a public status page confers a number of benefits to your organization at all levels. Although it seems daunting at first, a number of companies like Heroku and GitHub have led the way in enforcing transparency inside their organization, and benefit from a number of advantages. Sales: trying to sell up into larger organizations? Public status pages help you appear legitimate in the face of uncertainty, and communicates competency in your ops and customer service processes. Customer Support: the best customer support interaction is one that costs you nothing. Letting customers subscribe to updates however they wish (twitter, rss, email, sms, webhook) meets them where they’re at, and you’ll avoid hundreds or thousands of the same support ticket wondering what’s happening and when it’ll be fixed.